Einstein’s theory of relativity forms the foundation of modern physics. It has historically held the unique distinction of being the only theory that could predict or explain certain experiments and observations. Today scientists agree that relativity not only works, but that it works well. Despite its level of performance and degree of acceptance by the scientific community, relativity happens to be 100% wrong. This article summarizes the series to show how each requirement is met and together represent the top 3 reasons why relativity falls short. Despite the depth to which relativity has been reviewed, Einstein’s work contains a significant math mistake the renders his theory invalid. The mistake occurs in Section 3 of his 1905 paper entitled, On the Electrodynamics of Moving Systems and is summarized as: the failed spherical wave proof. Specifically, Einstein says that he must prove that the principle of relativity and the principle of the constancy of the velocity of light are compatible. Without the proof, all Einstein has is a set of equations; no theory. As summarized in Part 2 of the series, the proof fails because the second shape is not spherical. The discovery of the failed proof is not obvious and is easily missed, because the steps Einstein performs are correct but incomplete to determine if the transformed shape is spherical. When properly evaluated, the transformed shape does not meet the requirements for a spherical shape, which means that Einstein’s proof establishing the theory fails. A common defense against this analysis is to suggest that the second shape is spherical if you take into account a relativistic idea like length contraction. Because the analysis summarized above targets the proof that establishes relativity, it means no relativistic terms or ideas can be used as a defense. Such defenses are tantamount to arguing that: relativity is proved because of relativity. While the failure of the spherical wave proof alone means that relativity was never correct, scientists will correctly ask: if relativity is wrong, why does it provide good answers and in some cases has been the only theory that has predicted certain experiments? 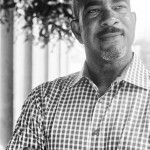 Answering this question requires that we show relativity is not unique; that it is an approximation of a new theory. Although leading scientists may not readily accept that relativity contains a mistake, they often acknowledge that a new theory may be developed that outperforms Einstein’s theory. If a new theory is to succeed it must perform equal to, or ideally better than Einstein’s theory. Introduced in DISRUPTIVE, Modern Mechanics is a new theory that produces results that are nearly identical to those produced by Einstein’s theory. It uses different equations than Einstein’s theory and provides different explanations for observations and experiments. Modern Mechanics is built upon the same foundation of geometric transformations as its classical mechanics cousin: It is not a reinterpretation of relativity. As summarized in Part 3 of the series, Modern Mechanics and relativity use different equations. However, when both are evaluated as a Taylor series, we observe that they share the same first expression. As a result, both will produce nearly identical results. In fact, their second expressions only differ by a factor of 0.125, an extremely small value that is only obtained when a moving system is traveling near the speed of light. Said simply, Modern Mechanics and relativity use different equations that produce nearly identical answers. 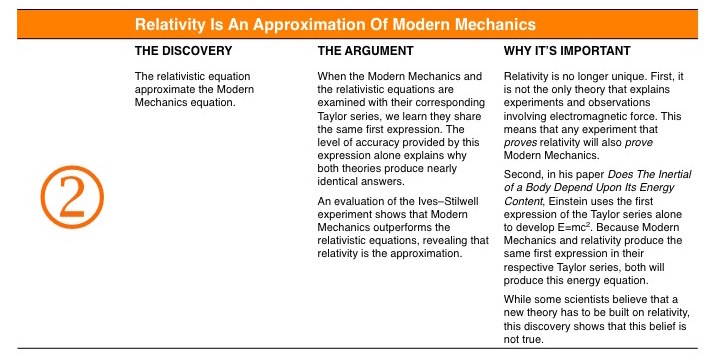 While both provide similar answers, we have identified an experiment where Modern Mechanics outperforms relativity. Specifically, the Modern Mechanics equations outperform relativity (which produces good answers) in the Ives–Stilwell experiment. This analysis reveals that relativity is not unique. It shatters the myths that relativity is the only or best predictor of many experiments, and that relativity is the only theory that leads to the equation: E=mc2. If Modern Mechanics and relativity often provide identical answers, scientists will correctly ask: is there any way to clearly distinguish Modern Mechanics from relativity? Answering this question requires us to evaluate an experiment where they make different predictions. As discussed above, the Modern Mechanics and relativity equations often produce nearly identical results. To distinguish one from the other we must identify an experiment where they make different predictions. Fortunately, such an experiment exists: the Michelson–Morley Interferometer experiment. The Michelson–Morley experiment is often described as producing a result of 0km/s, which scientists have used to support Einstein’s theory. However, as discussed in Part 4 of the series, their result is not 0km/s. In this analysis, we make two discoveries. First, an answer of 0km/s is not statistically supported. 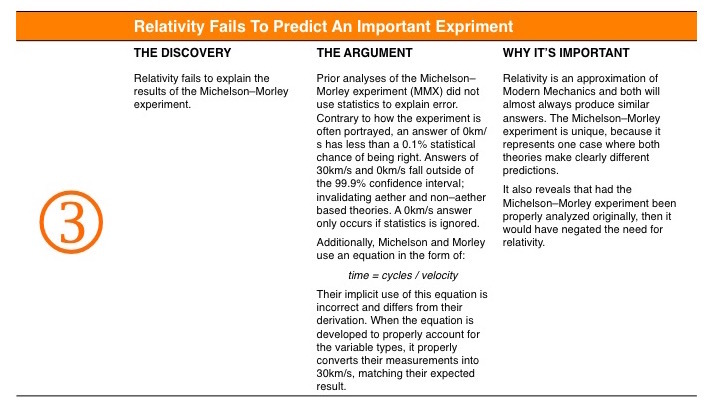 Second, Michelson and Morley use an incorrect equation when they convert their measurements into a velocity. However, the mistake is not obvious and is only detected through a reconciliation of their derivation with how their equations is actually used. Once the displacement equation is corrected, it properly converts their measurements into a velocity of 30km/s, matching their expected result. The Michelson–Morley experiment is important because it represents the one experiment where Modern Mechanics and relativity make clearly different predictions. Fortunately, Modern Mechanics properly predicts and aligns with the result. Conversely, the relativistic result disagrees with what the experimenters thought they would observe. Their result does not statistically support an answer of 0km/s, which relativity requires. 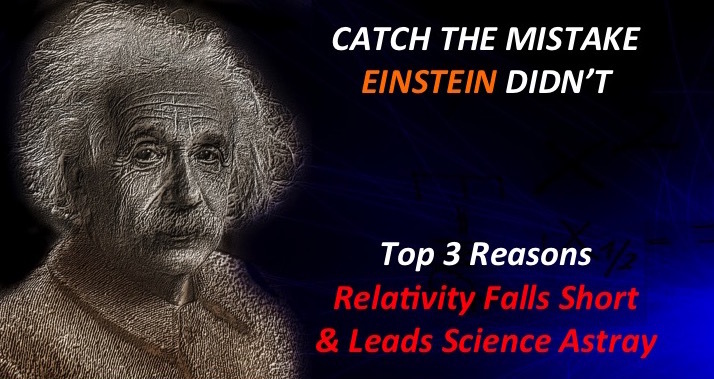 Each of the top 3 reasons why relativity is wrong help to tell a complete story: Part one identifies an incurable mistake that makes Einstein’s theory wrong. Part two explains why Modern Mechanics and relativity will almost always produce similar results; which means relativity is not uniquely alone. It also shows that relativity is an approximation of Modern Mechanics. Finally, part three shows an important experiment that relativity fails to properly explain. The first discovery proves relativity is wrong, the second explains why it gives useful answers, and the third demonstrates where it clearly fails. Without the benefit of Modern Mechanics as a comparison, it is easy to understand why scientists have supported and defended Einstein’s work. Yet the fact remains, Einstein’s theory is wrong and we are no longer are constrained by non–intuitive ideas like length contraction and time dilation, or limitations such as the restriction that nothing can accelerate beyond the speed of light. Relativity falls short where Modern Mechanics prevails. 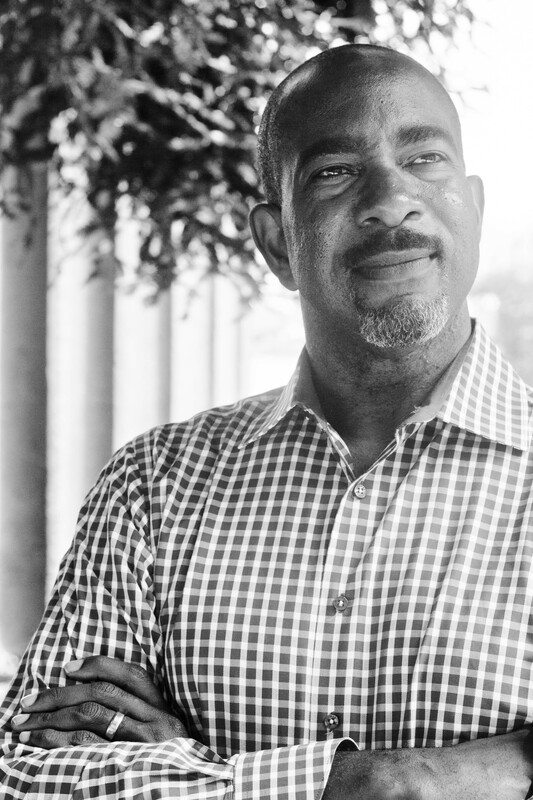 Together we stand at a new threshold, representing a unique and rare time where we are able to make new significant discoveries that will advance our scientific understanding!